Juli Sanchis i Aguado best known as „Harca“ was born in 1942 in Picassent, Spain. He is working as a freelance artist and cartoonist and colaborates with numerous newspapers and magazines. He also published several his own books (Quart el meu poble, La Etapa Negra, Vull la Lluna). Harca had a number of individual exhibitions in many countries (Spain, Croatia, Italy, Argentina,…) and participated in innumerable collective exhibitions at home and all over the world. He is the most awarded spanish artist and won lots of prestigious prizes and mentions at international cartoon competitions around the world (among many others in Tokyo, Seoul, Taipei, Bursa, Haifa, Gabrovo, Trento, Duisburg, USA, …). 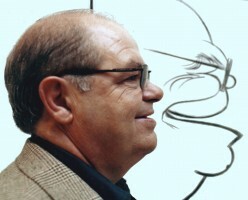 He has served also in many juries of cartoon contests in Spain and abroad. Harca was one of the organizers of Samples „Freedom of Expression“ and „Earth in danger“, and also organized other exhibitions named “Evolution and Creatonism” and “Violence”. Juli Sanchis Aguado is an „Honorary Professor of Humour“ at the University of Alcala de Henares and „Notary of Humour“ by the Alicante University. Some of his artworks are included in „The World Encyclopedia of Cartoons“ of the United States of America. Harca is the Vice-President of FECO-Spain. He is living and working in Valencia, Spain.